Circular Shapes: Geometry in Minera Escondida, Copper Mine, Chile. Map and News. Elearning. 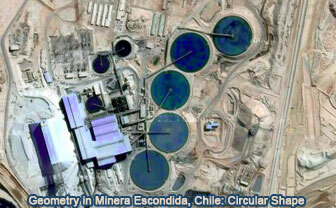 Explore the geometry of the Minera Escondida, Copper Mine, Chile through Google satellite imagery. To Pan: click and drag the map. Take advantage of the zoom bars. Minera Escondida, which means 'hidden' in Spanish, is a mining company that operates two open pit copper mines in the Atacama Desert, 170 km southeast of Antofagasta in northern Chile. It is currently the highest producing copper mine in the world. Source: Wikipedia, Escondida.